When bull kelp is alive it can be found floating offshore with the bulbs dipping in and out of the waves. When bull kelp is dead, it can be found on the beaches along the Pacific Coast, especially after storms or in the winter after it dies off for the year. It ranges in colour from green to brownish-yellow. It is identified by the bulb which acts as a float at the surface of the water and is attached to a long stalk (stipe) which attached on the ocean floor. The floats can reach as large as 12cm wide and the stipe can grow up to 20m long. Attached to the bulbs, are long narrow blades which can be up to 3m long. When choosing a place to harvest bull kelp, make the water is clean. For example, the water around Victoria is contaminated from sewage and thus, is not suitable for harvesting bull kelp or other species. 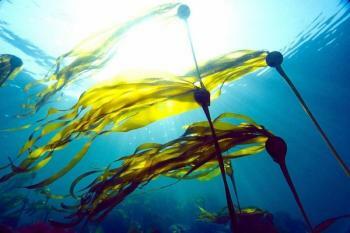 Bull kelp is commonly found along the West Coast from Alaska down to central California. It anchors to rocky substrates up to 20m deep most commonly in areas with high currents or moderate wave presence. It can be found in both intertidal and sub tidal zones growing in relatively high densities, creating large kelp forests which form habitats for several other sea animals. Bull kelp was used by indigenous peoples for their fishing gear and storage containers. The bulb and parts of the stipe were used to steam bend branches of fir for their bentwood halibut hooks. The solid part of the stem was used for fish lines after being soaked in fresh water, stretched and twisted for extra strength. Several could be joined together with a fisherman’s knot to make a longer line. As well, nets, ropes, harpoon lines and anchor lines were also made from Bull kelp. Commercial companies use kelp extracts as thickener in products such as salad dressing, ice cream, hand lotion and paint. The bull kelp species is a part of the Great Brown Seaweeds which are the highest of seaweeds in iodine content, and their fiber is only partially digestible. However, their extracts, such as fucoidan, fucan, laminarin, lignanas, and alginates are exceptionally valuable in both food and medicine for its high vitamin and mineral content. Cooksley, V. G., & Cooksley, V. G. (2007). Chapter 1: A Gift from the Sea. In Seaweed: natures secret to balancing your metabolism, fighting disease and revitalizing body and mind. New York: Stewart, Tabori & Chang. Turner, N. J. (2001). Coastal People and marine Plants on the Northwest Coast. 69-74. Retrieved from darchive.mblwhoilibrary.org. Koukel, S., & Rodgers, R. (2015). Bullwhip Kelp [Pamphlet]. Alaska: University of Alaska Fairbanks Cooperative Extension Service.